The earlier conversation was in Cairo, and the contrast between the two events could not have been more clear in Ignatius' mind. "The center of our conversation was what does the death of Jamal Khashoggi and what does the lack of press freedom in Egypt -- in Saudi Arabia, in China, in Russia, go down the list -- what does that mean to young people who want to be journalists, who want to do our work and face terrible risks?" Ignatius said. "As one of the deans at American University in Cairo said, ‘We want them to be free (to tell the truth), but we don't want them to go to jail,'" Ignatius said. "It's a reality check to go out in the world and talk to people who are doing my job. Literally every day they write something controversial, they are at risk." 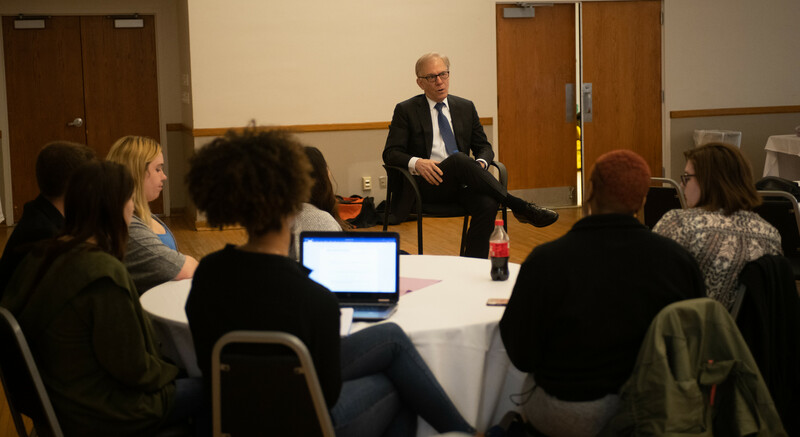 "Jamal Khashoggi's death is personal for us at the Washington Post," Ignatius told students. "He was our colleague -- we loved having him in the office -- and he was my friend for the past 15 years. He was somebody who I knew well. I made a promise to myself, as did many of my colleagues when we learned of his death, that we wouldn't just let this go." Ignatius asked students what they -- as future ISU alumni and aspiring journalists -- thought about Khashoggi and what was the reaction on campus. Andrew Hile, president of the ISU student chapter of the Society of Professional Journalists, said they talked about it in class and were inspired to memorialize Khashoggi. "We wanted to get the ball rolling (to honor him)," Hile said. Ignatius has written extensively about Khashoggi's death and the international political fallout. Students asked Ignatius what he thought Khashoggi's legacy will be. "One thing that would amaze Jamal would be what a difference his death made. In many ways, he was a shy person. He was not a guy who loved to go on television," Ignatius said. "The idea that his death would have this galvanizing effect, that people here in Terre Haute would dedicate lectures to him would have special meaning to him." "The idea that we're not there to challenge people's assumptions, as opposed to reinforcing them, really concerns me," Ignatius said. It's more important than ever for journalists to write about items of importance -- no matter the web analytics -- rather than "throwing red meat" to feed base audiences. "When you think about journalism as a career, find an outlet that will resist that," he said. Khashoggi's legacy stands as inspiration to tell the truth, no matter the risks. "The fact about Jamal is he was someone who just could not stop himself from telling the truth. He knew the risks he was taking. It's not like he just walked into that consulate with no idea. He thought about giving it up, and he just couldn't do it. He was a courageous truth-teller," Ignatius said. "He was passionate about the work he did. He loved being at The Washington Post, because his voice was amplified and he had the power to reach people around the world. When he would come to our newsroom and walk around, he was like a kid with a big smile on his face -- there were three floors with journalists all working to do this work that he loved." 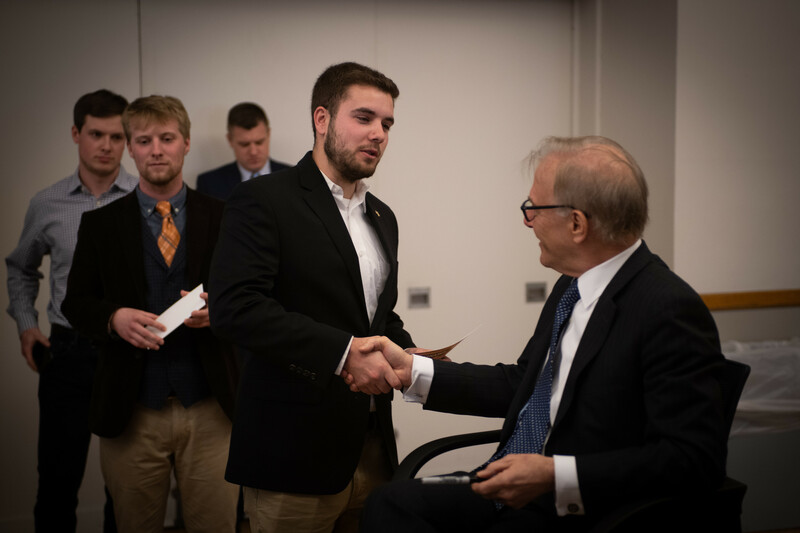 Photos: https://photos.smugmug.com/Events/Events-by-Year/Campus-Wide-Events-2019/Ignatius-David-Speaker-Series-2019/i-twnrmrg/1/2749cb50/X5/04_02_19_Ignatius-5648-X5.jpg -- Andrew Hile, president of the Society of Professional Journalists student chapter, shakes hands with David Ignatius Tuesday, April 2, 2019, in Tirey Hall. https://photos.smugmug.com/Events/Events-by-Year/Campus-Wide-Events-2019/Ignatius-David-Speaker-Series-2019/i-DKDFPGp/0/a8a1e31c/X5/04_02_19_Ignatius-5585-X5.jpg -- Students listen as David Ignatius talks Tuesday afternoon in Tirey Hall. 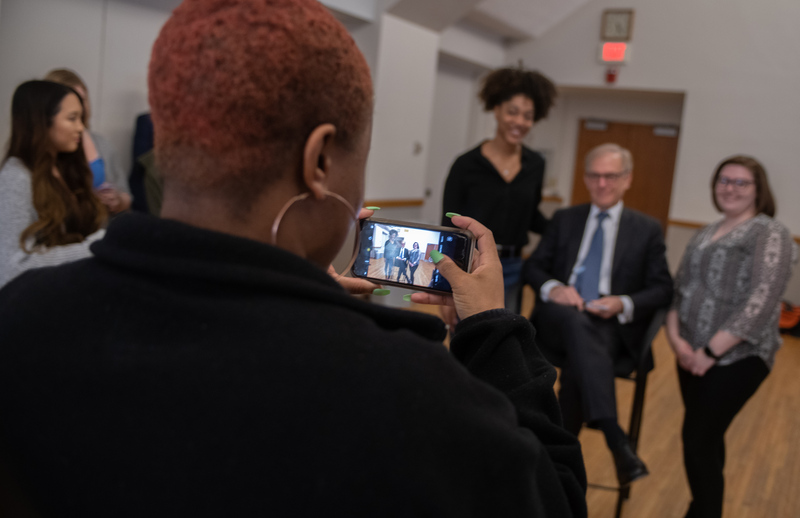 https://photos.smugmug.com/Events/Events-by-Year/Campus-Wide-Events-2019/Ignatius-David-Speaker-Series-2019/i-rQBz9wz/0/2a765ee1/X5/04_02_19_Ignatius-5617-X5.jpg -- Students pose for photographs with David Ignatius Tuesday afternoon in Tirey Hall.